Balance Transfer: One Card to Pay Them All! 1. 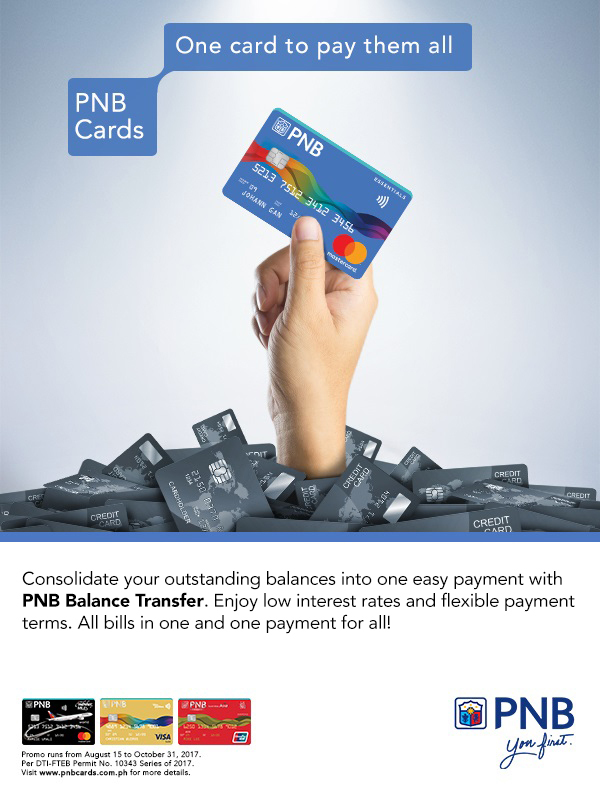 The Balance Transfer (BT) promo is open to all active principal PNB credit cardholders in good credit standing excluding Corporate and Distribution cards. 3. PNB shall have the absolute and exclusive right to approve or reject the Balance Transfer request. 4. To apply, cardholders should simply call the 24/7 Customer Service at 818-9-818 or DTF 1800-10-818-9-818 and request for a Balance Transfer. Cardholders may also fill out the Balance Transfer request form. 6. The BT request will be processed for a minimum of seven (7) banking days. 7. BT will be processed on a per transaction basis. Cardholder may not combine balances from different credit cards to reach the minimum amount required. 8. Cardholder may split the amount he/she wants to transfer and apply it for different terms. 9. Cardholders can transfer balances from non-PNB credit cards under his/her name or from non-PNB credit cards under his/her relatives' names, up to parents, spouses, and children. Cardholder must submit a copy of marriage contract or relevant birth certificate as proof of relation. 10. Balance Transfer transactions shall not earn reward points. 11. Balance Transfer application shall be subject to evaluation. Accommodation shall be based on the card holder's credit standing, account status (must be active and no past due), and available credit limit. 12. Cardholders may inquire about the status of their Balance Transfer request by calling the 24/7 Customer Service at (02) 818-9-818 or DTF 1800-10-818-9-818. 13. The amount that can be transferred shall be the balance in the issuing bank's Statement of Account or the available credit limit in the card holder's PNB credit card, whichever is lower. Only 80% of the credit limit or available balance of the card holder's PNB credit card, whichever is lower, may be used for Balance Transfers. 14. In case of insufficient credit limit, PNB has the sole discretion to determine and approve only a portion of the Balance Transfer amount applied for. 15. PNB shall issue a check payable under the name of the issuing bank indicated on the request form. Check will be directly deposited to the issuing bank's nearest payment center. As proof of settlement, cardholder may refer to his/her monthly Statement of Account of the card the balance transfer originated from. 16. Cardholder must continue to pay the minimum amount due required by the other credit card company while the application is still in process. PNB shall not be held liable in the event of delay of payment or rejection/non-acceptance of payment. 17. The Balance Transfer first monthly installment will be immediately posted to the card holder's SOA upon approval of request. 18. In case of early termination, PNB shall impose a 5% handling fee based on the remaining unpaid installment amount or Php500 whichever is higher. The unpaid total amount plus the applicable fees will be posted back as regular straight transaction. 19. The monthly amortization amount shall be posted as a regular transaction on the card holder's credit card account and shall form part of the total outstanding balance. Should the cardholder choose to pay less than the total amount due but not less than the minimum amount due, the monthly amortization shall be subject to the applicable finance charges. 20. Failure to pay any two (2) consecutive minimum amount dues shall constitute default and the remaining unpaid amortizations and the total outstanding balance shall immediately become due and demandable. 21. Cardholder acknowledges his/her liability to PNB for the Balance Transfer request that has been approved and that will form part of the card holder's obligation to PNB. 22. The terms and conditions governing issuance and use of PNB credit cards shall apply. 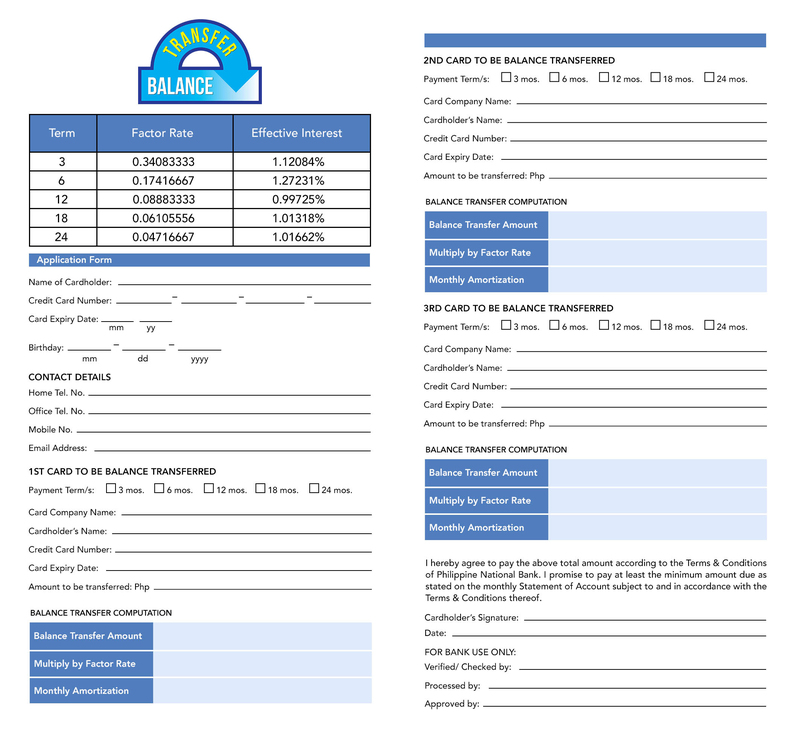 Click here for Balance Transfer application form. Per DTI-FTEB Permit No. 10343. Series of 2017.